When we first moved into our 1900’s Victorian house, I fell in love with the charm, history and location. We immediately knew this was the house we wanted as our first home and to raise our daughter, Taylor. If you are in the real estate industry, you know the word “charming” is a term often used to also describe “small”. Actually, I’m sure you know this is no matter what industry you are in. 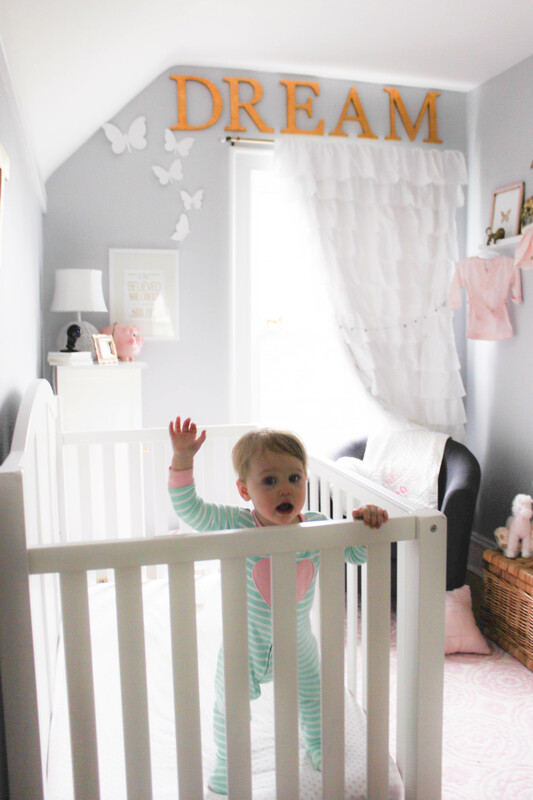 Needless to elaborate, the nursery is tiny! 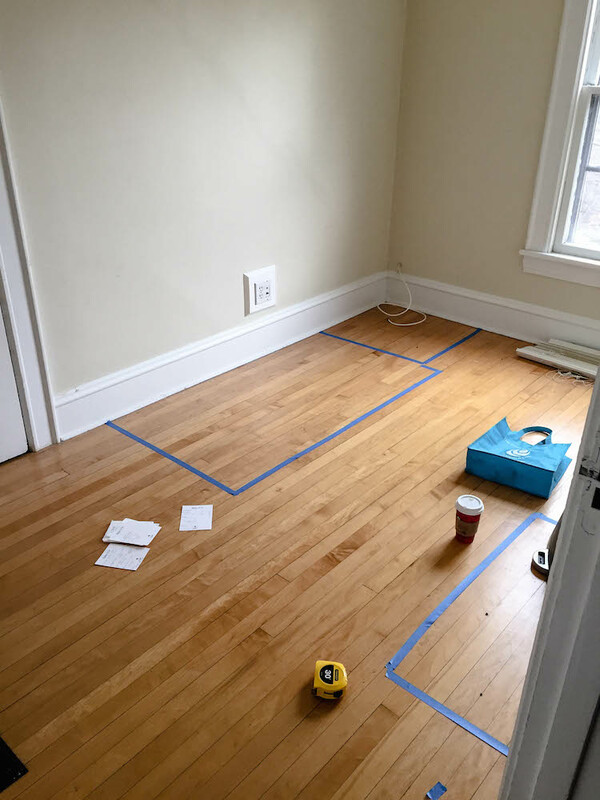 Luckily, the closet is a converted crawl space so we have plenty of storage for this little one. And yes, we use every single inch of that storage! I never imagined how much stuff such a small human being could have. Making sure the furniture will fit! 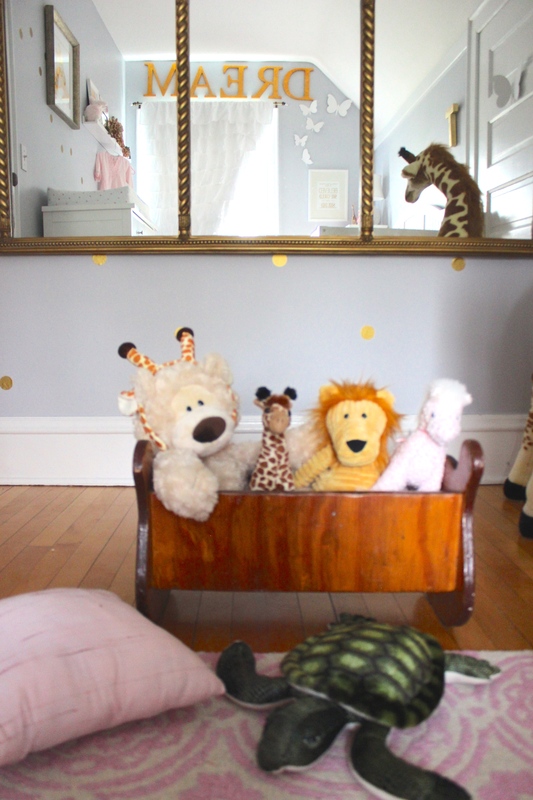 As soon as I found out I was pregnant, I dreamt of some sort of a safari themed nursery. I wanted to be surprised about the gender, which honestly was partially due to keeping my baby shopping under control! Now everything is pink, which I LOVE but at least we have a few gender neutral things just in case a boy comes along one of these days…. 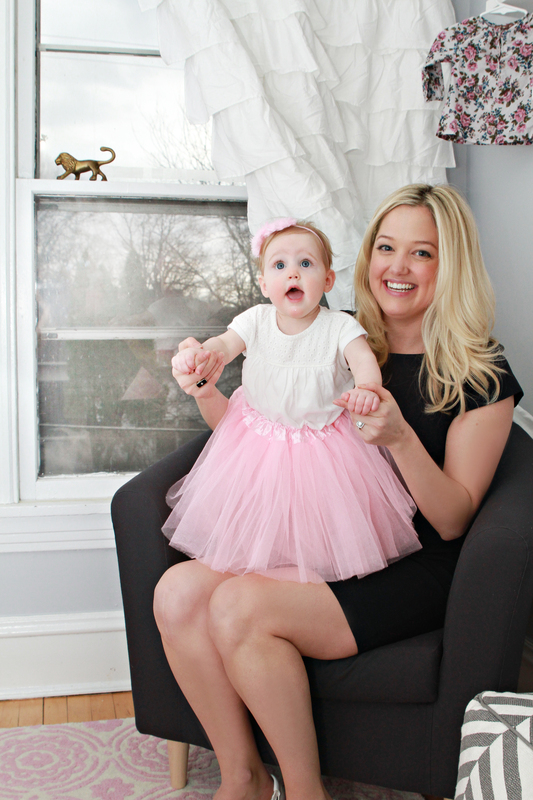 I was actually very good about not going overboard with baby clothes and decor especially since we were in between homes towards the end of my pregnancy (long story short – our apartment in the city sold quickly and the transition to the suburbs was a tough one for this native Chicagoan!). 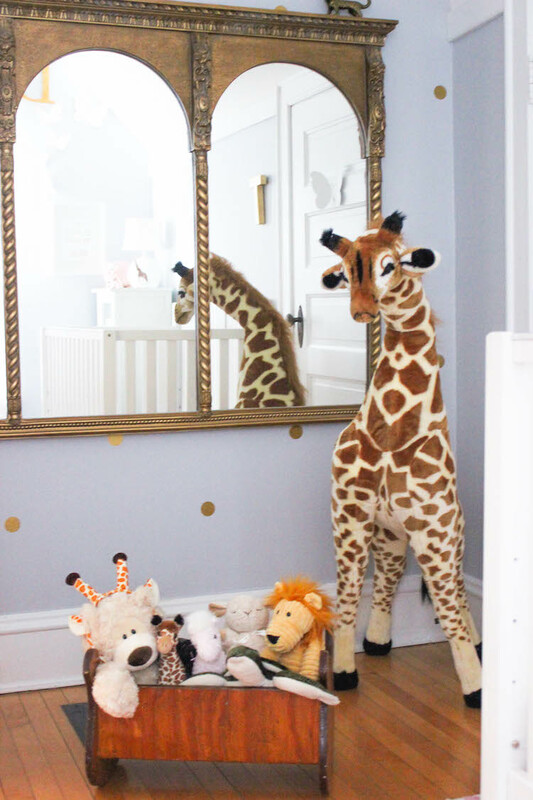 The very first thing I did purchase for the nursery were a couple of little giraffes. 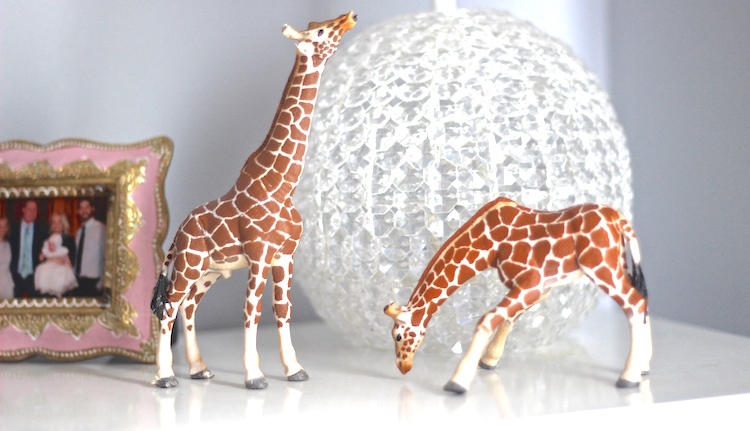 While driving to brunch one afternoon my with cousin Kelly, I saw a huge giraffe in the window of a store, immediately pulled over, waddled went in, took a breath, and settled for the small figurines instead. I think that’s when it began – Giraffe mania! 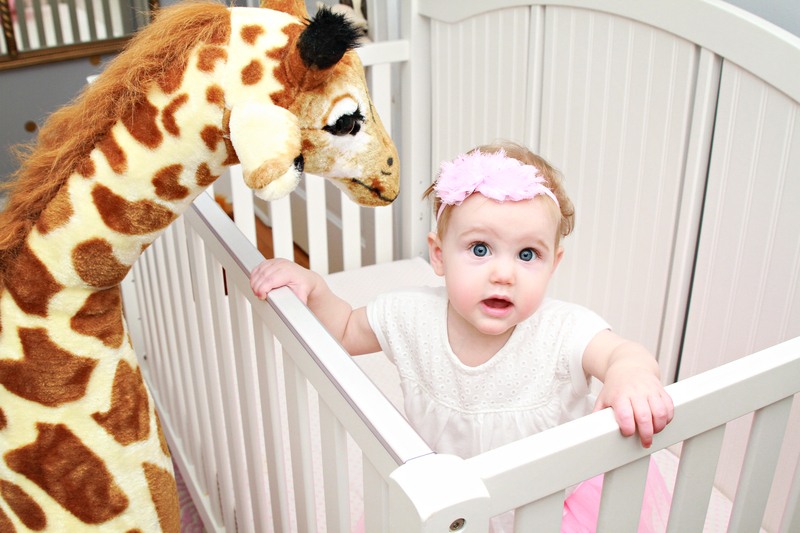 I’m sure this comes as no surprise to my friends and family as I received many Sophie giraffe toys at my shower – which I am very thankful for because teething Taylor loves them. 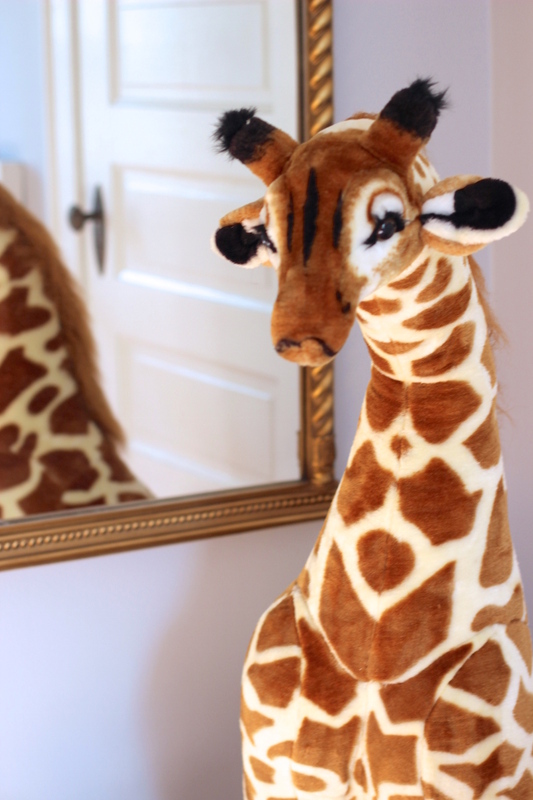 Oh and we also have that huge giraffe I wanted by the way, thanks to Auntie Coco and Uncle Sean! 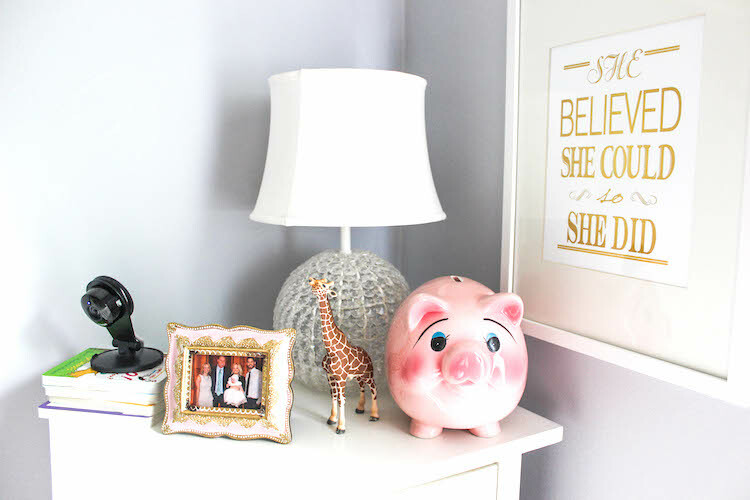 When I started designing Taylor’s nursery in our new house, I wanted to a neutral grey paint color. I loved the purplish undertones of Benjamin Moore’s Sidewalk Gray that would complement the pink and gold accents beautifully. 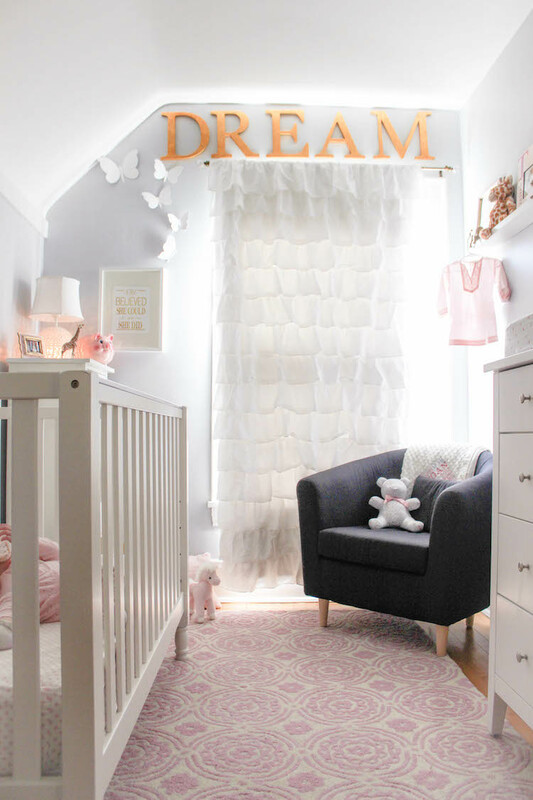 We already had picked out the white crib from Potterybarn and dresser from Land of Nod (outlet!). The white cabinet was formerly used in our apartment for extra towels and bath items but the size and color were perfect for the nursery. I knew a chair was a must but the one we originally used was way too large for this room. I decided to go with the IKEA chair for the scale and unbeatable price. Also, by the time we moved into this house, the night feedings were rare (finally!!). I do suggest for the mama’s-to-be to invest in a quality chair or glider because anything that makes getting up every couple hours during the night a little comfortable is worth the extra money. Since the room is so small with one window, bringing more light in was key. 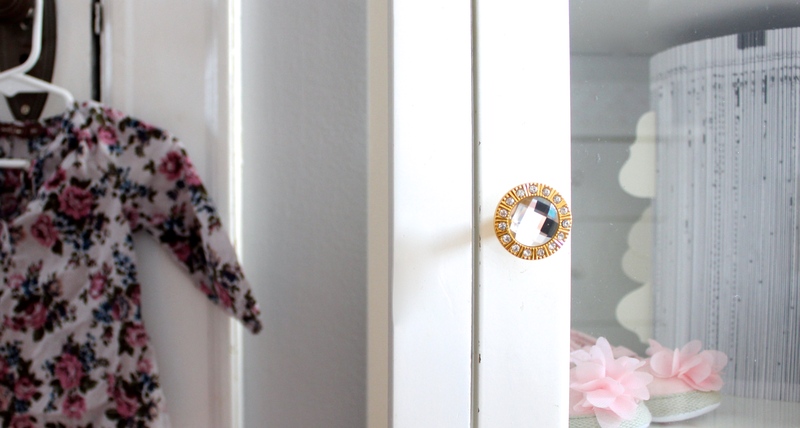 What better way to do that with a huge mirror? I love how it reflects the window to maximize the natural light. With that said, blackout drapes were a must! Imagine taking a very necessary midday nap in a sun filled room? Not going to happen. The blackout drapes are from Potterybarn kids and I went with the white not only to keep the room light, but to coordinate with our existing furniture. 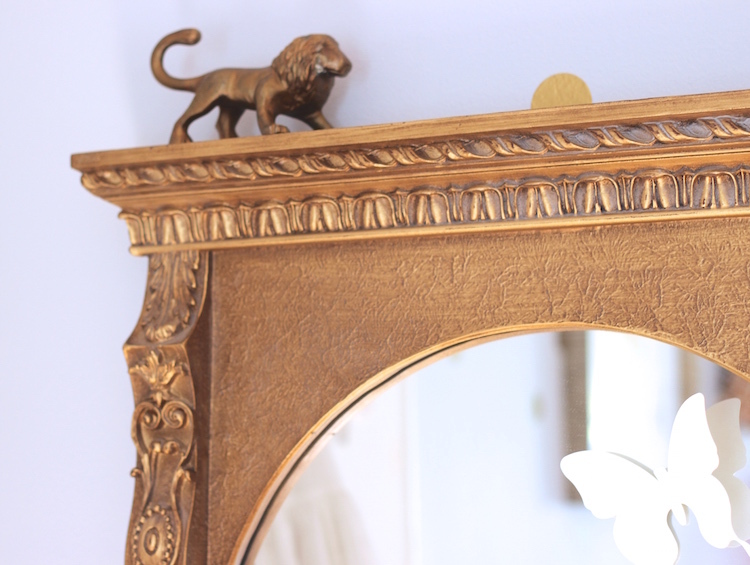 I found this amazing mirror in my mother-in-law’s basement and once I saw it, I knew this room was in need of more gold! 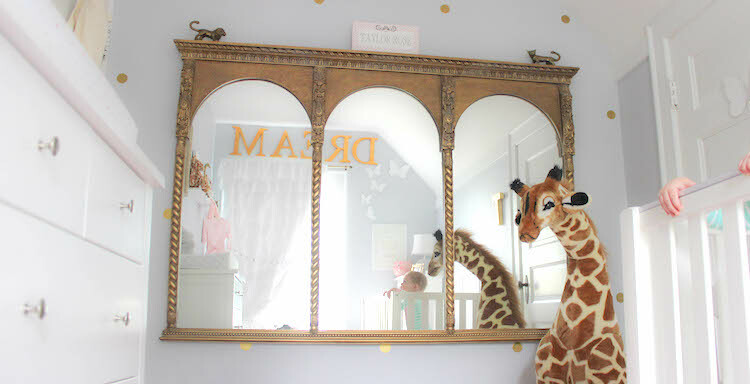 To soften up the mirror and add a playful element, I added some gold wall dots and a couple gold animals on the ends. 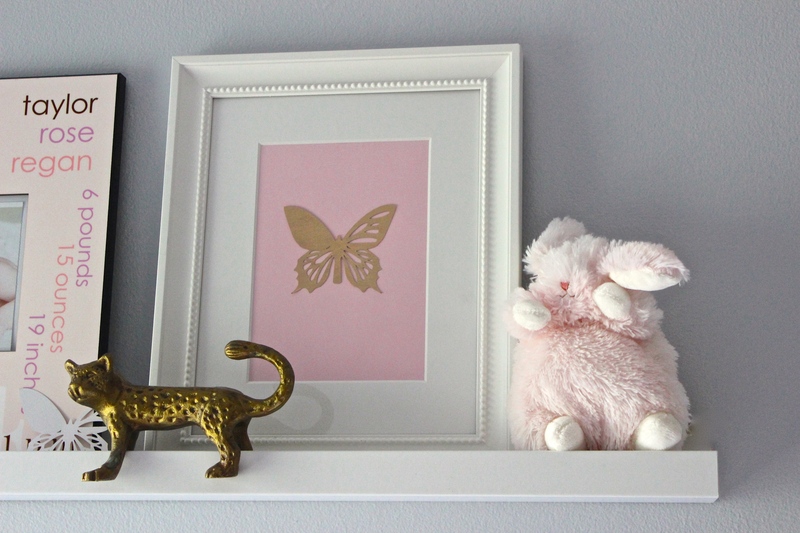 These animals are actually wall hooks that I bought pre-pregnancy just knowing they would end up in a nursery someday. Voila! 3.) I recently swapped out the hardware on the cabinet for a little extra gold touch. 4.) I created some easy DIY artwork with some gold leaf and butterflies that were leftover place cards from my wedding. 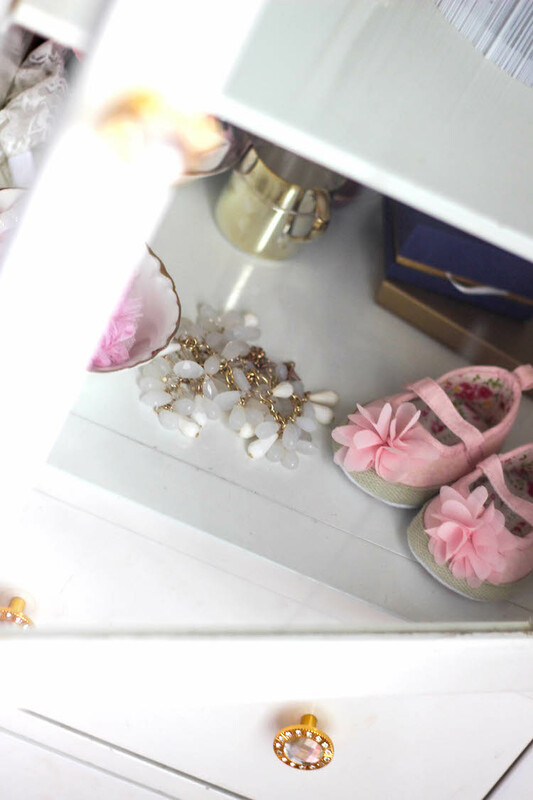 A light pink shade to me is so girly and innocent – which is probably why it is the most timeless choice of color for a baby girl. 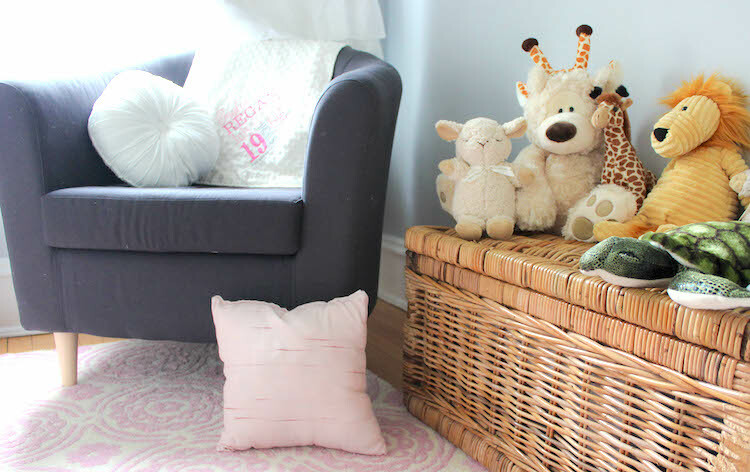 I incorporated pink with the rug, crib sheets, laundry basket, picture frames, and a few stuffed animals (of course!). My absolute favorite piece in this room has to be this toy crib which also flips over to a stool. My Dad made this for me when I just turned one and I will always treasure it. 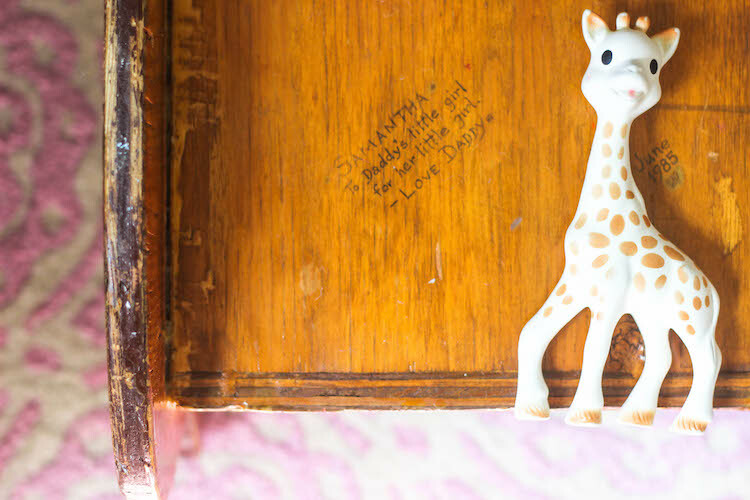 He wrote on the bottom: “To Daddy’s little girl for her little girl”. I think every designer or interior stylist has an area that is their favorite to design at the moment. For me this constantly changes but I have to say I am always up to help out with a nursery! Images taken by myself and Lauren Michelle Studios.